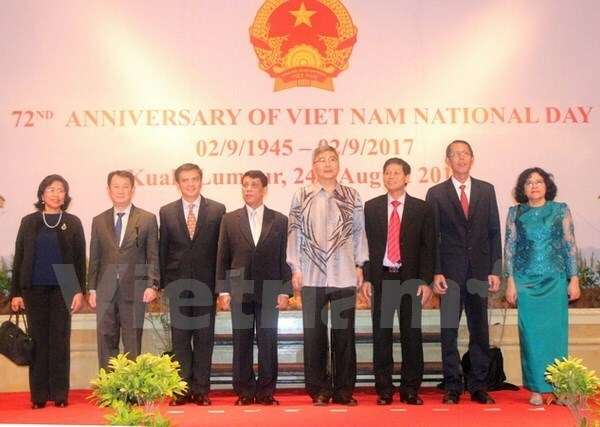 Hanoi (VNA) – A ceremony was held in Malaysia’s capital city of Kuala Lumpur on August 24 to celebrate the 72nd anniversary of Vietnam’s National Day (September 2). Vietnamese Ambassador to Malaysia Le Quy Quynh highlighted Vietnam’s achievements gained after over 30 years of the “Doi moi” (renewal) process and international integration. Vietnam is now an open-door and dynamic economy with stable gross domestic product (GDP) growth of 6.4 percent over the past 15 years. The Southeast Asian country is a reliable partner of over 180 countries as well as a responsible and active member of regional and international organisations and a popular destination of overseas investors and tourists. Over the past 45 years, the relations between Vietnam and Malaysia have seen strong developments with the peak being the establishment of the bilateral strategic partnership in 2015. The bilateral cooperation has been reinforced and expanded in various fields from politics, security, economics and labour to education and tourism, he said. The two countries are focusing on implementing an action plan for 2017-2019 to realise the signed bilateral strategic partnership agreement, he added. The Ambassador said Vietnam and Malaysia have many opportunities to elevate their relations to a new height in the coming time. As members of ASEAN, the two countries will push ahead with comprehensive cooperation and implement the ASEAN Community’s targets in addition to boosting coordination at regional and international forums for peace, stability and development, he noted. The same day, a celebration of Vietnam’s National Day and the 50th founding anniversary of ASEAN was held in Tanzania. Vietnamese Ambassador to Tanzania Nguyen Kim Doanh described ASEAN as a dynamic association and indispensible partner of the international community. ASEAN is now the sixth biggest economy in the world with a common market of over 600 million people. In 2016, the bloc’s GDP reached 2.6 trillion USD and its economic growth hit 4.6 percent. Addressing the event, Tanzanian Minister of Industry, Trade and Investment Charles John Poul Mwijage recalled his good impression of Vietnam’s development during his visit to the country in late July and early August. Tanzania wants to learn experience from Vietnam in national building and economic development, he said.